If you've moved from FreshBooks Classic to try out the new FreshBooks and for some reason you need to switch back to Classic, you absolutely can. Note: If you originally signed up on the new FreshBooks, the below steps won't apply to you. 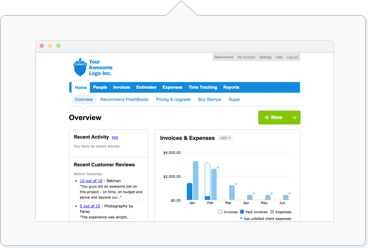 We're constantly making changes to the new FreshBooks and would love to hear your thoughts. If you have any feedback to share (especially on what did or didn't work for you), don't hesitate to give us a shout at help@freshbooks.com or call us at 1-866-303-6061. You'll then be taken back to your account. Moving forward, you can log in using your custom url, the subdomain associated with your Classic account (https://examplecompany.freshbooks.com) and your previous username. If you see Fundbox listed as active, you'll need to reach out to us by phone or email so we can manually disconnect it for you. This will then allow you to see the Switch back to FreshBooks Classic link. If you have any issues moving back to Classic or you need help with saving any data before switching back, shoot us an email over at support@freshbooks.com or call us at 1-866-303-6061.